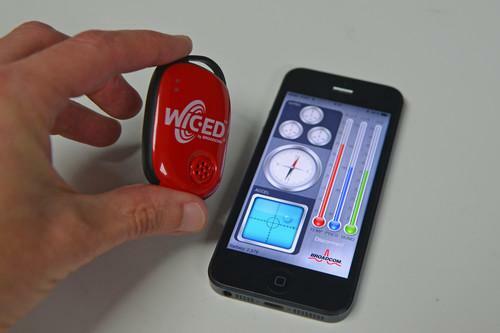 Broadcom's WICED Smart Tag development kit and its included iOS app. The Internet of Things may have been the talk of the tech industry for months now, but communications chip maker Broadcom thinks it's just getting started. "It's a totally new space. It offers ... a massive number of projects and efforts and new ideas," said Brian Bedrosian, senior director of Broadcom's embedded wireless business, at a media event in San Francisco on Tuesday night. "There's no monopoly in any particular market." Broadcom has a big stake in IoT because it makes the kinds of chips that will connect many home devices, wearables and industrial sensors to wireless networks. On Wednesday, the company introduced the latest tool it hopes will expand that market, a US$19.99 development kit built around its BCM20737 Bluetooth Smart chip with five built-in sensors and a free Apple iOS app. An Android app is coming Oct. 1. The WICED Sense Tag, the latest in a line of WICED (Wireless Internet Connectivity for Embedded Devices) kits that launched about two years ago, is designed for app coders and non-technical product developers rather than just engineers, Bedrosian said. It costs less than earlier kits, which have been priced around $80 to $100, and includes software for Bluetooth Smart and the sensors, saving developers hours of work, according to the company. The tag is the size of a large key fob and includes a gyroscope, an accelerometer, a compass, a barometer and a humidity and temperature sensor. It also includes iBeacon technology, wireless charging support and secure over-the-air download capability for firmware updates. It took just a couple of taps to pair the tag with an iPhone via Bluetooth Smart and start viewing readings from the sensors. Broadcom envisions the kit being used as the basis of prototypes and products in a wide range of areas, including fitness, home and building automation and health care. The company wants to help speed up product development and initial prototyping is the most common step to hold up IoT development, often taking a month or two, Shaw said. Broadcom gave the new sensor to students before launch; in less than two days, one group of students developed an initial prototype of a temperature and humidity monitor for a baby's crib. That kind of turnaround is what the company wants to see, Shah said. Getting more IoT devices on the market more quickly could help to drive sales of Broadcom's Bluetooth chips, which is how the company ultimately could profit from the WICED Sense Tag. The tag's hardware design is open source, so users can download its schematics online and modify them. It's already been certified by the U.S. Federal Communications Commission and European and Japanese certification bodies, which should save developers additional effort, Broadcom says.